A GRAND GETAWAY THAT IS SUITED FOR ELITE SUMMERTIME RETREATS. Inspired by Mediterranean seaside villas, this elegant home accommodates 22 guests in eight en-suite bedrooms. Located in the posh Ocean Sands community in Corolla, guests will enjoy stunning ocean views from an almost-oceanfront perspective, and will be close to the wealth of attractions, shops and restaurants that this picturesque coastal town has to offer. BEAUTIFUL NEW PLUSH CARPET WAS ADDED IN 2016. The oceanfront is just a shell’s throw away via the community boardwalk to the shoreline, but guests won’t have to leave home to enjoy a full day of fun by the water. A 12'x33' swimming pool with lush grassy borders, an adjacent hot tub, a gas grill and an outside shower can all be found just outside the door, inviting families to dip their toes in and relax the day away. After a long day on the sand, head to the ground floor which was designed for family entertainment. The well-equipped recreation room offers billiards, free-play PacMan/Ms.PacMan/Galaga arcade video game, push hockey/ping pong, soft tip darts, multi-game table, 26" high definition TV, and an adjoining kitchenette with a refrigerator, ice maker, and microwave, which is ideal for prepping poolside snacks. There’s also a state-of-the-art media room nearby which boasts 9 plush oversized theater chairs , a 400 DVD library, and a 110" projection screen with 7.1 surround sound that utilizes Polk speakers. A half bath is located on this level for extra convenience, and guests can also unwind in one of two master bedrooms, which includes one with a king bed, and one with a pyramid bunk and regular bunk. The expansive top level is home to the bright and open great room which exudes a taste of European elegance with beamed ceilings, terra-cotta tile floor, marble wood burning fireplace, Persian rugs, wall murals, and a high definition TV that’s bordered by deeply comfortable furnishings. The adjacent Tuscan gourmet kitchen features a self-cleaning double convection oven, 6-burner range, dual dishwashers, and every appliance necessary to prepare decadent gourmet meals. NEW THIS SEASON -BEAUTIFUL STAINLESS STEEL SIDE BY SIDE REFRIGERATOR. Enjoy sea views from the dining room while feasting at the round inlaid wooden table with seating for fourteen, or settle into the limestone-topped kitchen island, with additional seating for 8 that’s brightened by colorful Venetian lamps. A wide ocean-facing deck is just steps away, and guests will enjoy a bird’s eye shoreline perspective from the towering rooftop deck. With a wealth of modern and luxurious amenities, and a lush Mediterranean flavor and style that brims with elegance, Summertime is a resort-quality vacation rental that will be a favorite escape for worldly Outer Banks lovers. Top-Level: Master suite with kind bed and private bath, living room, dining area, kitchen half bath, decks and stairs to rooftop deck. Mid-Level: 5 master suites (4 with King beds and private baths, one with pyramid bunk and bunk set and private bath. Ground-Level: 1 King suite with private bath, 1 BR w/pyramid bunk and bunk set and private bath, gamer oom with pool table, ping pong, arcade games, fax machine, XBOX, theater room with 9 plush recliners, pool area, enclosed outside shower. Half Bath. Additional fee to heat the swimming pool. Please request pool heat one week prior to arrival. Pool can only be heated if the evening temperatures allow. Gorgeous Views guaranteed from this luxury 8 bedroom home just steps from the ocean. New Carpeting installed. XBox One. New indoor and outdoor furniture. New refrigerator installed. Elegant and sumptuous villa for rent in the outer banks with stunning and sweeping ocean views from almost anywhere in the house. New for 2016-New Carpeting is installed, Smart TV's in Media Room and Living Room, New Pool Heater, new dining room chairs and bar stools. Enjoy your getaway to this elegant Mediterranean style villa that is just 15 yards to the beach access. Even if you do not wish to walk on the beach, you can enjoy sweeping views of the Atlantic ocean and 30 acres of unspoiled beachfront land--all from the comfort of your own beautifully decorated Mediterranean villa. KEYLESS ENTRY: No need to drive to the rental office, wait in line, and pick up keys. Just drive directly to the house. When the house is ready, you could go in. Indoor entertainment options abound with a state-of-the-art media room that features plush oversize chairs, high definition DVD player, Sony overhead projector, 110” projection screen, 7.1 surround sound utilizing polk speakers, xbox 360, smart tv with streaming Netflix, and 400 DVD library. Watch your show or game in life size on the 110 inch screen in high definition. Or watch your game in high definition while playing pool or cards in the billiard room. The well-equipped recreation room offers billiards, free-play Pacman/Ms. Pacman/galaga arcade video game, push hockey/ping pong, soft tip darts, multi-game card table, 26' high definition plasma TV, adjoining kitchenette with refrigerator, ice maker and microwave. The 30’ x 10’ swimming pool can be heated May thru October. There is a 5 person hot tub, 4 burner Weber gas grill and outside shower. The outdoor area is landscaped with grass. A wood paneled elevator takes you to the third floor great room for a taste of European elegance with its wood-beamed ceiling, terra-cotta tile floor, carved marble wood -burning fireplace, leather sofas, nautical antiques, Persian rugs, wall murals, high definition TV. The Tuscan gourmet kitchen features viking double convection oven, viking 6-burner range, dual dishwashers and every appliance necessary to prepare meals for your family. Enjoy sea views from the dining room while feasting on an inlaid wooden table seating fourteen. Additional seating for 8 is available at the limestone topped kitchen island while basking in the glow of colorful Venetian lamps. Relax on the two outdoor decks adjoining the dining area or on the rooftop deck with access by straight stairs. Enjoy unobstructed sweeping views of the Atlantic ocean and wildlife on acres of unspoiled beach-front land. The master suite is also on the 3rd floor and provides an oversize whirlpool bath for two, separate shower and double vanity. WiFi, Elevator, computer, high speed internet, dish network w/ all movie channels, free unlimited long distance, premium mattresses, six king suites, TVs, jetted tubs or multi-jetted shower, 2 bedrooms with a bunk set and pyramid bunk each, two roll aways, two half baths, ceiling fans, washer/dryer, community pool and tennis included. Linens provided. (6 kings, 2 bunks, 2 pyramid (duo) beds, 2 rollaways). No smoking. 15 yards to beach access. Premium linen service (sheets and towels), check-in from home. If you are interested, please ask for Summertime cottage #1684. My husband and I have always loved the natural beauty of the Outer Banks. A recent trip to Venice and the Amalfi Coast of Italy inspired the decor of the interior of this house. Sometimes while staying at the house, I will be inside for a whole morning or afternoon. But, I still feel like I am on vacation because the interior is beautiful and I enjoy the wild beauty of the beach views from the living room, dining room and kitchen. The pictures do nice job of conveying the general feel of the place, but it is really beautiful inside and a lot of attention to detail has been paid. I also love the media room and enjoy a recent movie every time I go down. The pool and hot tub are also outstanding. And, the stargazing cannot be beat no matter when you go down. This is probably the best location in the Outer Banks. As we stated in the description, the house abuts undeveloped beach front land. The main benefit of that is the beach itself is not as crowded as other sections of Ocean Sands. Also, there are no condos or town homes in Section H of Ocean Sands, and that means that the beach is not crowded. We feel that Ocean Sands has the best beach in the Outer Banks. The sand is finer than anywhere in the obx. And, you do not have the 4 x 4 trucks on the beach like in other areas up north. The house location could not be beat. It is a semi-oceanfront, but don't let that title fool you. I have been in my neighbor's oceanfront houses, and I can honestly say that the view from our house is the same. You will see pelicans and seagulls fly over the water from the kitchen, dining room and living room. When I arrive, I relax. Everything is in the house for me to enjoy a nice vacation. I love the media room and pool table. The sound in the media room is amazing. I have been in movie theatres with less ideal sound. My husband becomes a kid again when he plays the pac-man/galaga machine. The kitchen is my ideal dream kitchen and I love cooking there. It is a well-supplied kitchen. I love the hot tub any time of year. I just love this place, I know that you will, too. Excellent. You will see seagulls and pelicans flying over the ocean from the top floor kitchen. Great Water Views from Inside the House. 15 yards to Beach access. Gorgeous ocean views from kitchen and dining rooms. Sweeping views along the coast from the rooftop deck. Oceanfront views at Semi-Oceanfront prices. Enough Room for 8 Vehicles. As part of linen service. 3 sofas, wood-burning fireplace, Smart TV. (2) 1st and 3rd floor Both have icemakers. 6 Burner Professional Series Range. High capacity Range Hood. Self Cleaning Double Convection Oven. (2) 1st Floor (1) and 3rd floor (2). Plenty of dishes and eating and cooking utensils. (2) Third Floor Kitchen has two dishwashers and a double oven and refrigerator and six burner range and microwave. Ground Floor Kitchen has refrigerator with icemaker, sink and microwave. 16 people can sit at the dining room table. 8 people can sit at the breakfast bar. TV in each King bedroom Smart TV with Netflix in game room and 3rd Floor living room. Charter Cable throughout the House. Including the HD 110 inch screen in the Media Room. DVD player in the king bedrooms. DVD in third floor living room and ground floor media room. Boat rentals available nearby, including fishing charters for World Class fishing. One large rooftop deck, and large patio with grass surrounding the pool. 2 small decks next to bedrooms on the second floor. One small deck next to 3rd floor kitchen. Fantastic Golf Courses nearby highly rated by Golf Magazine. Private 12 x 33 in ground pool. Abuts undeveloped land and is very Private. Outdoor Gas Grill and Table and Chairs. Chaise Lounge Chairs by pool. Outdoor shower. Sits 6 people. Open Year Round. Private Location. Not on Street. Abuts undeveloped land. HGTV would love this house! had a quite large selection of movies. Beach access was close and convenient. Yes, there were positives, but this house really needs HGTV Beach Reno!! It is a great exaggeration to call this house an HGTV makeover show. There are some things that need to be repaired or replaced, but seriously this not an HGTV makeover show. 1. We are replacing the carpets for 2016. The carpets that were there were cleaned last spring. But, the cleaners over-soaked the carpeting which caused bunching of the support layer and flattening of the carpet fibers. So, now we are getting new carpets for 2016. 2. The existing tile will be deep cleaned by the people who installed the tile flooring. For some reason, Seaside Vacations never called them to address the tile flooring. Well, we did, and that issue will be addressed. 3. The wifi speed that I purchased with Charter communications is the fastest wifi available in the Outer Banks. We add routers to each floor to improve the wifi. 4. We checked the furniture and the bedroom furniture is fine. The mattress we slept on was comfortable. We are replacing the dining room chairs and barstools. We are looking for quality Amish made chairs and barstools. 5. There is grass around the pool because of building restrictions. Our choices were grass or stones. We thought that grass is a little more comfortable than stones. 6. There were plenty of baking pans, cookie sheets, pots and pan. We ordered drinking and wine glasses. That would have been done if the renter had asked. 7. When we visited this October, the windows did have a thick film of sand on them. They are usually cleaned in late spring. But last September, there had been a hurricane followed by a nor'easter, and a lot of sand got kicked up. The sand piled up on 5-6 stairs leading down to the beach. So, we ordered that the windows get another cleaning. 8. There seemed to be not enough outdoor chairs and end tables on the decks. Again, there was a storm and they were put in storage, and apparently not put out again. There are chairs and tables on the decks now. 9. We used the appliances last October. Both of the Viking double ovens, dishwasher, microwave worked well. The icemaker is getting fixed. 10. We used the coffeemaker and the toaster and they worked. Management is going to test every small electric this spring. 11. We are installing an XBox One. We will resolve the streaming issues for Netflix in the living room and media room. We have addressed the maintenance issues. We have never said no to repairs or upgrading. We have had many happy renters, and hopefully will have many more. We rented this house through Seaside Vacations - we always go through Twiddy and will return to them. This house has a fantastic location and amazing views - which made up for the numerous faults....this home is in serious need of extensive repairs/updating...there was not one room that didn't have something not working. Our biggest complaint was the disgusting red, old, dirty carpet through all the bedrooms and halls. It's just gross! Also - the pool and the outside of the house need major sprucing up - the furniture was falling apart, there is grass all around the pool which gets in the pool making it dirty and also in the house. There was trash all over the right side of the house (beer cans, cigarettes, etc.) The wifi in this house was terrible - everyone was kicked off all the time - we had to call to have it re-set. The refrigerator was broke all week and we had to have a pan of water in front of it for the leak. We did call and the repair man told us it was our fault for putting our items from the cooler in it??? Anyway, we were too annoyed to call back - someone else can deal with it! The dishwashers seem to be coming loose from the cabinets - they felt as if they were coming out of the cabinets - there were no baking sheets, cake pans, a set of measuring cups...etc...everything was very mis-matched...we hardly had any regular cups to drink out of, but an entire kitchen cabinet full of margarita and martini glasses?? ?..it was not cleaned well when we got there - spider webs all over and our room had toenails beside the bed when we got there!!! The toilets in several bedrooms didn't flush properly - the furniture in many of the bedrooms was ENTIRELY oversized - to the point that you couldn't even move or open drawers...the beds were so hard - several of us had bad backs and hips from sleeping on them.The dvd player didn't work in our bedroom - there were no instructions on how to use the tv's or the media room (which was nice, but didn't have any movies from the past 10 years or for kids)...the lighting was terrible in many of the rooms - I had to use the half bath to put on makeup because the lighting was so dark in bathroom. The sliding door to ships watch barely opened. Although we knew going into this home that it was going to be quirky, it was a bit too much for us - a naked woman hanging over the elevator???? Not very kid appropriate..we were not the only ones to feel this way - the guest book is embarrassing for owers!! We got some friends together to enjoy March Madness. The place is great. There are terrific views from the house and you are merely seconds away from the beach. It was fun to watch the games on the giant screen. The beds were super-comfy and Seaside was very helpful with all of our questions. We cannot wait to book it again for a summer week. Made for LARGE groups - 8 Br!! Last year(2014) we made a change from a place down the street to this house. What a difference!! Key features for us: Roof top deck, Home Theater, Views, very comfortable bedrooms. The 9 of us are going back this year. Ed and Mary Ellen F.
The house is beautiful and is in an excellent location. We were at the beach access within seconds. The pool and hot tub were great. We had lots of fun in the rec room and media room. We enjoyed waking up to the terrific ocean views from the kitchen and the outdoor decks. This is a very nice place to spend your Outer Banks vacation. The decor has a very Italian theme, with lots of interesting decorations. The theater room is fantastic for movie fans. It really seems like being in a small movie house. The close proximity to the beach is a great plus as well. All in all, a very nice place. I hope to get back to it again. The house is on paved roads. It is not 4x4 territory. Two large supermarkets are conveniently located only a mile and a half away--Harris Teeter and Food Lion. There is plenty of restaurants and shopping within a mile of the house. There is keyless entry for convenience. 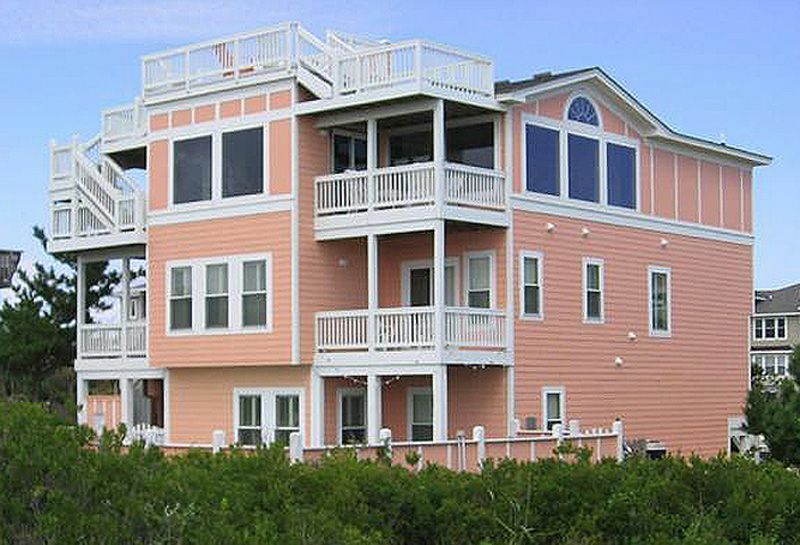 The house is professionally managed by Seaside Vacations, with a local office in Corolla. Go Karts and Movie Theatres are nearby. and, 2.) wild Mustang horses in 4x4 country. Both very short drives. There is a Great Aquarium and the Elizabethan Gardens in historic Manteo. Wright Brothers Flight Memorial in Kill Devil Hills. Lost Colony in Roanoke. Gorgeous Elizabethan theatre on the water to tour where the play Lost Colony shows in Summer. Fantastic golf at Currituck Club. Rates include cleaning fees and linen service. The minimum stay is for 3 nights for a minimum of $750. Any stays charged below $750 will be responsible for cleaning fees.